Wow, that's a scary title. It just hits me sometimes how fast our school year is going. 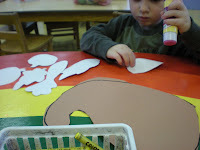 We have one more week of Thanksgiving activities for my class, which actually equals two classes. We come back from break and have 6 more classes to finish out the 2009 year. Yes, a total of 8 classes left before we start 2010. That just doesn't seem right. We started Thanksgiving this week. 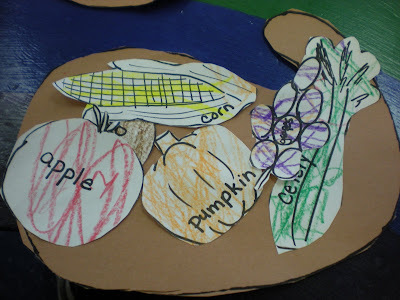 I try to meld the good food unit with Thanksgiving, so we start by making a cornucopia. I won't go into too much detail as you may have seen this last year when we made it. 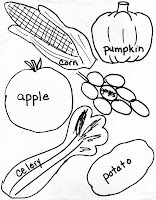 I give the children a page of fruit and vegetables to color. Mrs. T and I will cut these out. 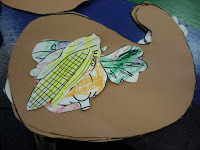 Then I give them a picture of a cornucopia, I have the children cut this out. This was the first big cutting project. 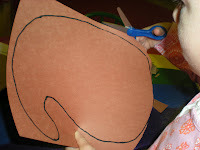 We did a little cutting for our paper jack-o-lanterns, but they just made slits. Here they were actually cutting out an object. I must say I was pretty impressed. I held the paper and helped guide, but they did the open/shut maneuver. I was amazed at how many of them were comfortable with this. They did a great job. Only a few needed more guidance. 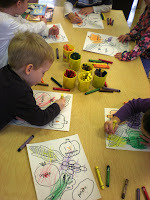 The children then glued on the food and we were ready to decorate. Thanks for the patterns! Can't wait to try it! Arg! Don't remind me. I feel like we just got started and already I'm falling behind in all the things I want us to do. We do a similar food project, but ours involves the kids cutting pictures of food from magazines and gluing healthy choices onto their plate, while throwing unhealthy ones in the recycling bin! Thats cool coz I'm doing this with my son too and I am hoping he's gonna love it.